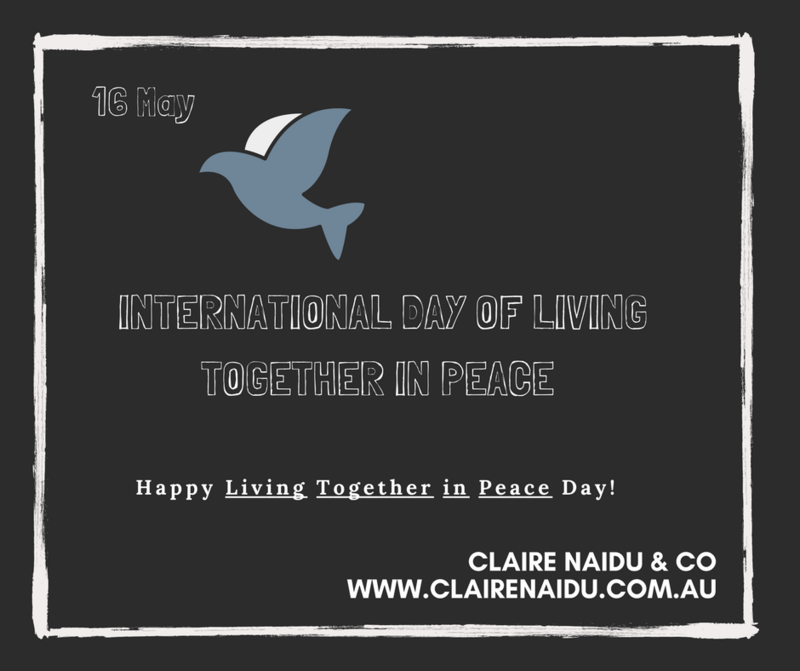 The 16th of May is the United Nations Declared day for Living Together in Peace. envisaged in the Declaration and Programme of Action on a Culture of Peace. It aims to promote peace, tolerance, inclusion, understanding and solidarity, and to express its attachment to the desire to live and act together, united in differences and diversity, in order to build a sustainable world of peace, solidarity and harmony. The day of Living Together in Peace also aims to acknowledge that living together in peace is accepting differences and having the ability to listen to, recognise, respect and appreciate others, as well as living in a peaceful and united way. Claire Naidu & Co focuses on conflict resolution and aims to work with parties to resolve their matters. We wish everyone a Happy Living Together in Peace Day. If you want to work with us for peace in your family relationships, contact Claire Naidu & Co. Click here for our details.